IBC 2017, AMSTERDAM – 16 September 2017 – Irdeto, the world leader in digital platform security, has been selected by Tata Sky, India’s leading content distribution platform providing pay TV and over-the-top (OTT) services, to enhance its end-to-end solution for OTT services. Tata Sky aims to launch the most innovative online video service in India to give consumers greater choice and convenience. Irdeto’s OTT solutions simplify the operations and workflow of supporting multiple digital rights management (DRM) systems, configuring consistent business policies across different devices and managing a massive library of media assets. Irdeto will enable Tata Sky to not only rapidly re-launch their service, but also have the flexibility to easily adapt their service and business model to meet changing demands. The pay TV market in India is highly competitive, yet there is tremendous growth potential for OTT services as disposable incomes rise. According to Tetra Pax Index 2017, 82% of the Indian population spends their time on mobile phones, and 2017 saw a 23% rise in internet users who spend an average of eight hours a day online compared to 2016. The first phase of the project has been launched with Android devices, and the follow-on phases will extend Tata Sky’s OTT service to PC and iOS devices. Irdeto manages the planning and deployment of the project for Tata Sky, including both implementing Irdeto’s own solutions and working with third parties to ensure successful end-to-end integration. 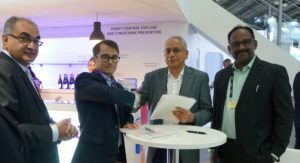 Tata Sky and Irdeto sign contract to launch next generation OTT media services at IBC 2017. From Left to Right – Sanjiv Kainth, Country Manager for India at Irdeto; Doug Lowther, CEO of Irdeto; Harit Nagpal, CEO of Tata Sky; and A. Arun Kumar, Senior Vice President of Supply Chain Services at Tata Sky. Irdeto is the world leader in digital platform security, protecting platforms and applications for media & entertainment, gaming, connected transport and IoT connected industries. Our solutions and services enable customers to protect their revenue, create new offerings and fight cybercrime. With nearly 50 years of expertise in security, Irdeto’s software security technology and cyber services protect over 5 billion devices and applications for some of the world’s best-known brands. Our unique heritage as a subsidiary of multinational media group Naspers (JSE: NPN) means that we are a well-established and reliable partner to help build a more secure future. Please visit Irdeto at www.irdeto.com.